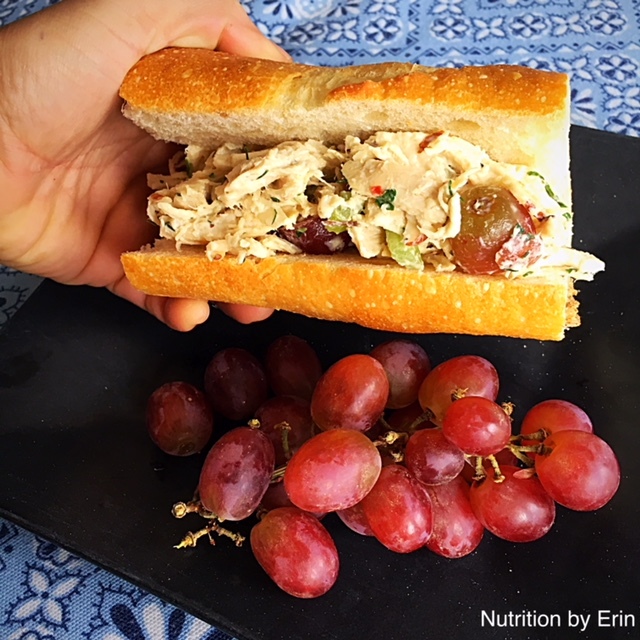 Some consider chicken salad a standard lunch-time fare, but this recipe will jazz things so you’ll be hooked all day, every day! Chicken salad usually consists of diced chicken, mayonnaise, and diced celery or onion. Not bad, but we can do better. This recipe is loaded with flavor! You’ll taste the sweet and crunchy red grapes, nutty and salty sliced almonds, and bright and earthy herb blend. It’s easy to throw together and eat all week long. Put some on a sandwich, top some on a salad, or just eat with a side of fruit for a quick breakfast. This recipe complies with the following diets. Low FODMAP– Yes, as long as you stick to 1/4 of the recipe, which provides 1/2 medium stalk of celery. Also, only use the green part of the scallion. Shred the cooked chicken breast into bite sized pieces and place into a large mixing bowl. Toss in the grapes, celery, and herbs with the chicken. Mix together. In a small bowl, mix together the mayo, mustard, lemon juice, salt and pepper. Pour over the chicken. Mix all of the ingredients together until well combined. Chill in the refrigerator for at least one hour prior to serving.